Obviously they didn’t want to hear my insurance woes. 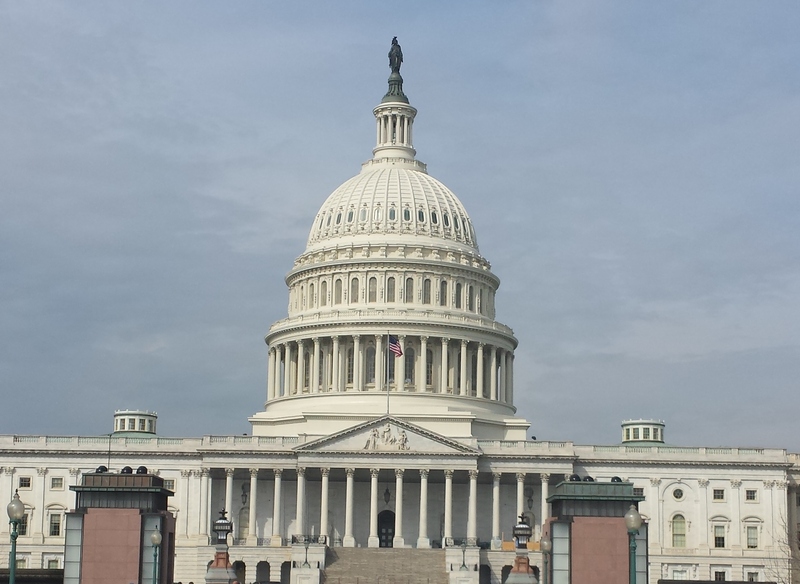 Our final day in Washington DC dawned bright and beautiful. 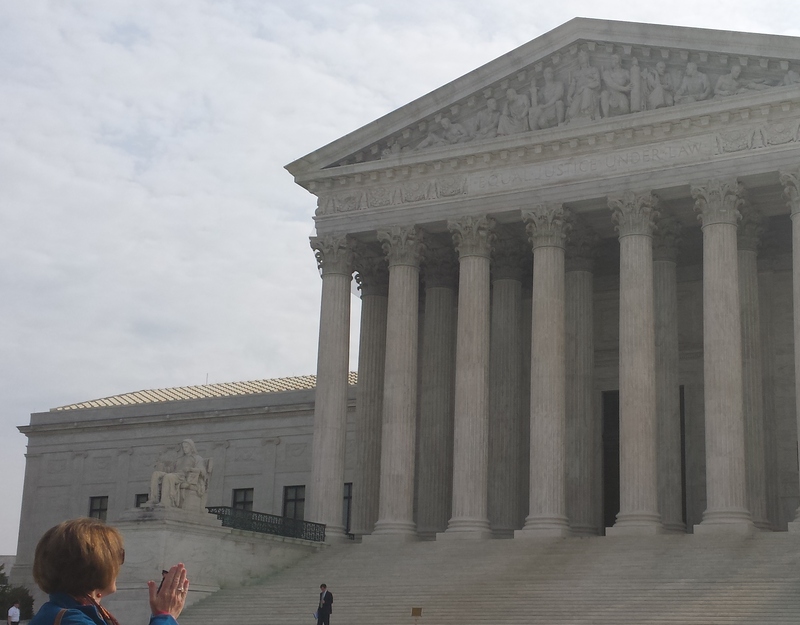 We rose early, anticipating our 9:30 tour of the Supreme Court. As those of you who follow this blog know, I have lost my health insurance, so I viewed this as another opportunity to plead my case. After all, if the Highest Court in the Land won’t hear me out, who will? Unfortunately, those nice people who run the Metro apparently weren’t aware of my plight – or our schedule. There was a huge back-up that caused us to miss our tour. On the upside, we got to experience – and smell – the local Metro riders at very close range. 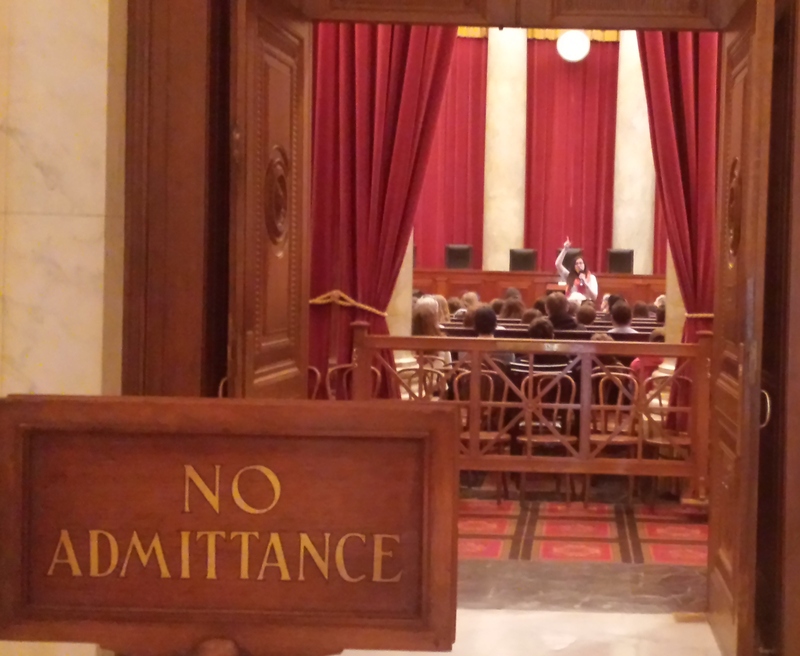 Despite missing the formal tour, we were still able to view the inside of the building and see the Supreme Court chambers from the hallway. It is MUCH smaller that you might imagine. 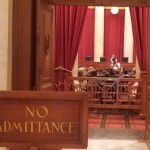 I mentioned this to my neighbor who has argued before the Justices and he agreed with me – he said he had been in small town courtrooms that were significantly larger than the Supreme Court. So just like the First Ladies’ ball gowns, things are not always the size you would imagine. As you can see from the picture (left) they apparently knew that I was coming ahead of time. Of particular interest to us was the exhibit that depicts Sandra Day O’Connor’s rise to the bench. Upon graduating from law school the only job she was offered was as a legal secretary! But she forged ahead and has been a great example of determination and fortitude. We visited the gift shop which sells all sorts of Supreme Court mementos, but somehow I thought it would be hard to take the Justices seriously after seeing them on shot glasses and bobble heads. We decided to bypass the tchotchkes and move on. Our next stop was an appointment with Shelley’s congressman, Ron Barber. Actually, our appointment wasn’t with him, but with staff that draws straws to see who has to lead the tours for constituents. We made our way into the bowels of his office building finding, once again, that the office of a Congressman is not as large as you might expect. Think of your dentist’s waiting room and you’re very close to the size of your elected official’s place of work. We had a wonderful tour of the Capital Building – the artwork and statues are truly breathtaking. The capital dome is currently under repair but even through the scaffolding we could see its beauty. 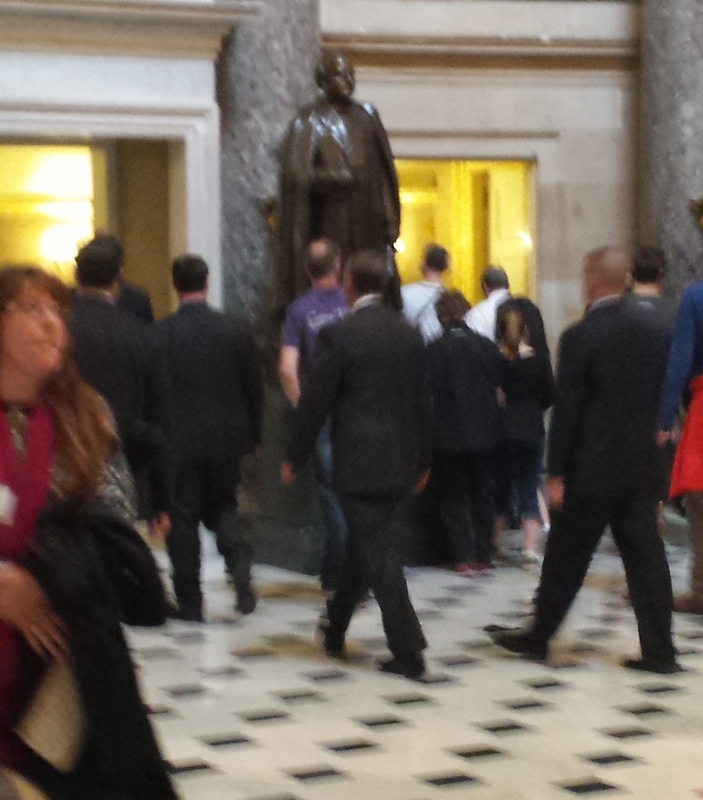 As we entered the National Statutory Hall we passed by the Speaker’s Office. I wanted to poke my head in, certain that he, of all people, would be sympathetic to my loss of insurance. Unfortunately, he wasn’t there. Or so I was told. They never let me get close. But then, as if by miracle, as we were touring the Hall, we heard some rustling and sure enough, the Speaker was walking right by us to his office. I shot up to the front of the crowd, jumping up to get his attention. You can see his reaction in the picture (right). Harumpt! All I can say is, he’s just as orange in person as he is on T.V. We moved on to the Senate Chamber, where we spent a long while, mainly because Abby loved being there and seeing all the goings-on. Which, frankly, wasn’t much because they were in recess. Senator Landrieu gave a speech with no one in attendance except the acting chairman. It’s rather odd to see a Senator give a speech to no one. Then again, the CSPAN cameras were on so for all I know people back in her state were listening with rapt attention. 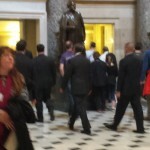 Several senators, including our own John McCain, walked through the chambers while we were observing so at least we knew he was working…or passing through on the way to the men’s room. We then progressed to the House Chamber where I was almost taken down by Security. 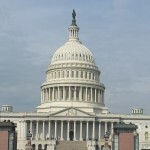 We had been through security check lines every where we went in Washington but it would seem they are most sensitive when it comes to protecting members of Congress (which is a bit odd given their popularity level). In any event, one half of a foil from a stick of gum set off the alarms. Sheesh! Once in the famous chamber, we tried to imagine State of the Union addresses from the past and where everyone sits. As it happens, there was an active debate on the floor concerning the definition of full-time work. Having spent my career in Human Resources I wanted to chime in with my opinion but I got the distinct impression they were not taking comments from the gallery. Besides, I already knew the Security Guards on a first name basis. One more disruption from me and I would have been touring the Capital clinker. Our beautiful Capital, and the cafeteria serves a great chocolate chip cookie too. Once our term on Capital Hill ended, we took a pedi-cab back to the Smithsonian American History Museum. Unfortunately, several busloads of intermediate school kids had been let off there to further their education. Here’s all I’ll say about that: if you are going to send your child on field trip to Washington, they should be going on tours, not goofing around with their friends as if they’re at the food court of the local mall. I think I’m getting old. Finally, we ventured back to Bethesda and to Tommy Joe’s for dinner. It was our luck that it was Trivia Night. We named our team “Elementary, My Dear Watson” and took second place. It was delightful to play as a team; because we spanned so many decades between us, we got most of the answers right. We only lost because we didn’t quite understand the bonus point system, which Abby tried in vain to explain to us. We should have let the youngest of our group be in charge. Anyway, we won a $20 gift card for our efforts. And Watsons, being nothing if not thrifty, used it when we toured Bethesda the next day. All in all, I have to say it was the trip of a lifetime. Even though I made no progress regarding my insurance. To spend five days with my niece was a gift – we have always enjoyed each other’s company so it was special to share this with her. And I have to say that if my two great-nieces are any indication of the future generation, we’re all in good hands. They “get” history and appreciate those who have gone before them. And for the 26 miles we walked in four days, they were extremely kind about “waiting up” for their Old Aunt Sue.